Marjorie Larmon did not suffer fools. 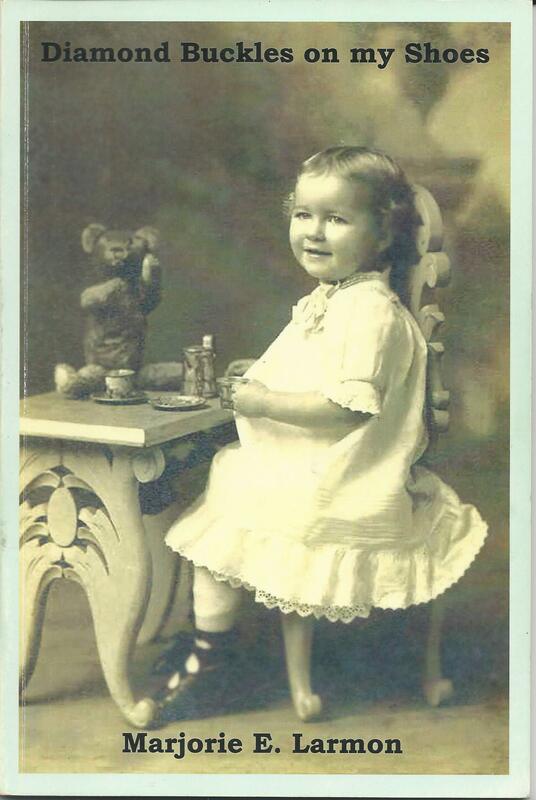 Born on November 14, 1912, she had been interested and involved with antiques since an early age. Her parents Roy and Ruby Sackrider were both interested in things from the past. At an early age, she and her father would look for antiques while selling maple syrup door to door. 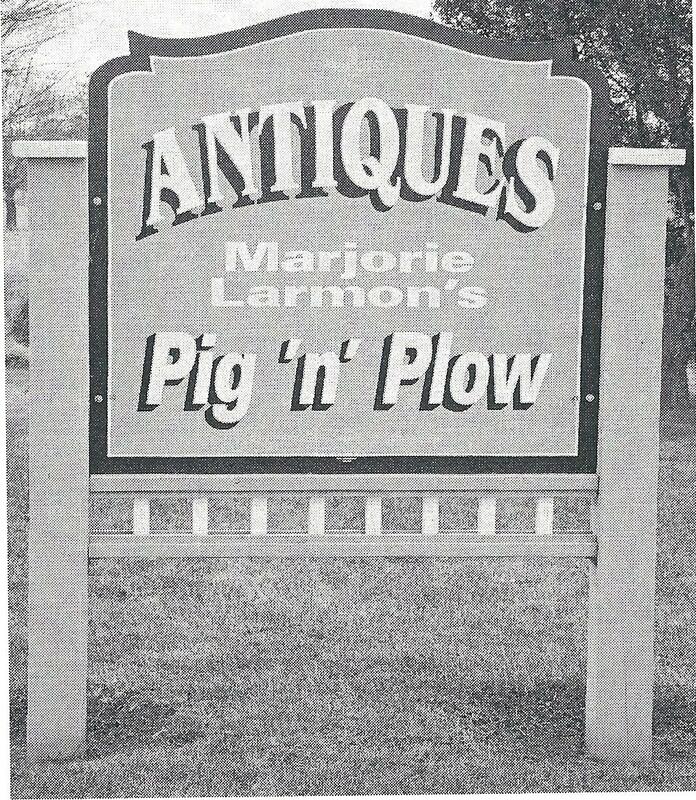 In the 1960’s she and her husband Clarence were able to buy the family homestead just outside Burgessville, Ontario, and Marjorie came into her own as an antique dealer, naming her business “The Pig and Plow”. If she got to know you, and liked you, she would tell you stories of her glory days, driving her hearse to Quebec and filling it with merchandise. Going into the ditch on the way back from a winter auction, etc. 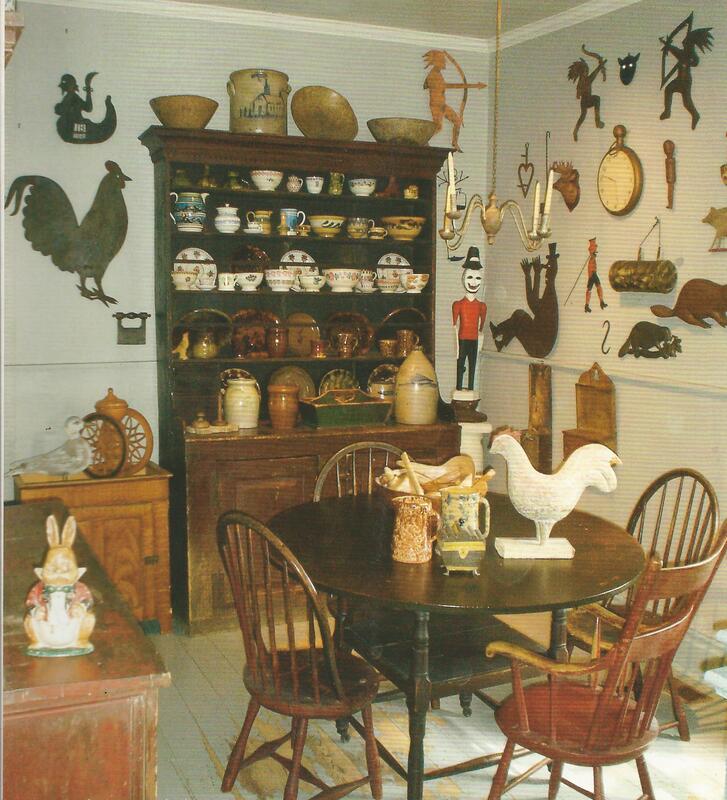 She placed many antiques in important collections over the years, and was an enthusiastic collector herself. Her barn was full of wonderful things, but the real treat was if she were to invite you into her home, where she kept the best stuff. Over the years she gave lectures, interviews, and conducted study classes at museums and historical societies. 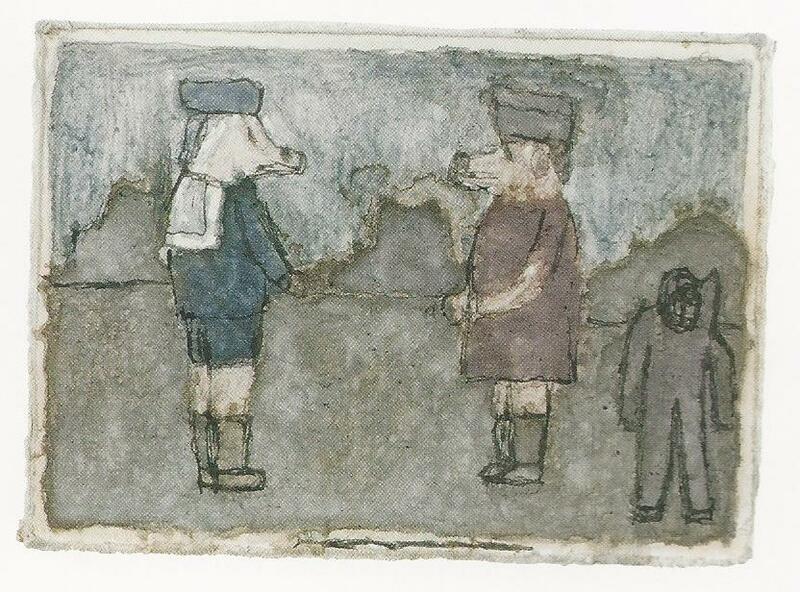 In 1982 the Art Gallery of Windsor held a show of her folk art collection entitled “Celebration”. In 2005 she brought out a little book outlining the story of her life entitled “Diamond Buckles on my Shoes” She was the real deal. She developed many lasting friendships and was always friendly and welcoming to knowledgeable collectors, but if she found you to be rude, or boorish, she did not hesitate to send you packing. When we moved to the church in Wyecombe we were told by other dealers to go and see her, but be careful in our approach, especially in trying to get a better price. Frankly we were intimidated and didn’t even go to see her for a year or two later, at which point we felt we had enough knowledge to not be rejected outright. On that first visit we realized that there was no reason to worry. She had heard of us through her main picker Jim Sherman, who had occasionally bought things from us for her. So when we gave our names she was immediately warm and welcoming, suggesting that after we had finished in the barn she would make us a cup of tea and show us her collection. We made a couple of purchases that day, and in the way of negotiation we simply asked her for her dealer price. She looked a bit stern at first, but then offered a fair reduction and so we accepted without argument. We had made her good books. Actually, that’s the way we have always preferred to negotiate. Most people respect this approach and give you good prices. Also, I find it saves a lot of energy. So we loaded our purchases and made our way to the house for tea and a tour. Mind blowing. What a wonderful way to spend a couple of hours. Her collection was better than what you would see at most museums, and she was sharp witted and quick to give you the story behind every piece. 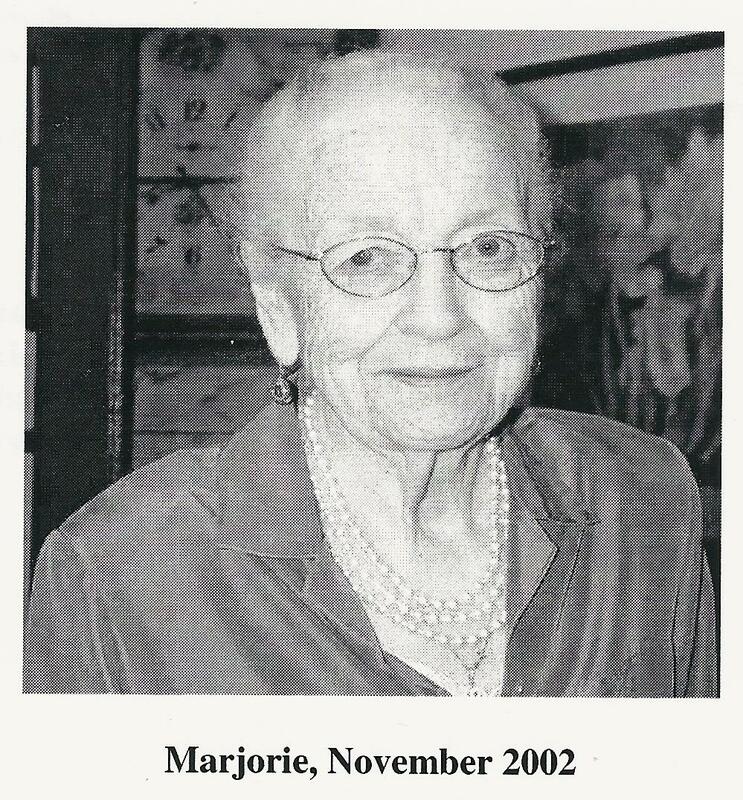 We made several trips to see Marjorie over the following years. She and Clarence were always welcoming. So it continued until after the death of her beloved sister Ina in 2000, and Clarence’s death in 2002 when it gradually became too much for her to continue even with the generous help of Jim Sherman, and so in 2006 she decided to retire. She and Jim Sherman arranged a classic one-day auction, with nearby auctioneers Jim Anderson, and Gerry Brooks, and everything went up for sale. It will be ten years since that historic auction this September 23rd, and will be the subject of a future blog. There are a few funny stories of Marjorie turfing out dealers for one transgression or another, but I prefer to remember her by telling about a visit we had with her shortly before she closed the shop. She had called and offered to sell us back a beautiful pair of large finials that Jim had bought for her a few months earlier. We couldn’t quite figure out why she would want to do this, but we liked the finials and the Bowmanville show was coming up so we said yes, and made the trip to pick them up. We finished our business in the barn and headed to the house for tea. We had a lovely chat and then she said “Come into the living room. There is something I want to show you.” We sat ourselves on the couch and waited feeling very curious. “Phil open up that corner cupboard and you see that decorated box on the top shelf; bring that down for me.” I brought down the most gorgeously carved and polychrome painted Scandinavian wedding box I had ever seen. “Jeanine, you are French, and this wedding box is French so I want you to buy it from me and take it to the Bowmanville show, and sell it for a lot of money.” We knew it was not French but we were smart enough not to contradict her, and so we timidly suggested that yes it was a lovely thing to offer us, and how much did she want for it? We were bracing for a big number and wondering if we could afford it. “Give me $200.” We could not believe our ears. We wondered if maybe she was losing it a little bit or we hadn’t heard right, or perhaps she meant to say something else, so we questioned her. “Marjorie, that’s a wonderful offer, but are you sure that’s all you want? I mean….” She cut me off. “No that’s the price and I won’t take a dollar more. You’ve been good friends and customers and I want you to sell it at Bowmanville. Do we have a deal? Of course we do Marjorie and thank you. We took it the following month to the show as she requested. We labeled it correctly as a Scandinavian wedding box in pristine condition with no repairs, and from the collection of Marjorie Larmon; and then we were totally shocked when the vetters came by and said we could not show it because it was not Canadian. Feeling a mix of rejection, disappointment, and some relief as we were happy to take it home and keep it for ourselves we put it aside. Then within moments, the vetter who had rejected it for inclusion in the show circled back and asked, “So what’s my dealer price on that.” We held our nose and sold it to him. Marjorie was thrilled when we told her what we got for it. We didn’t tell her the circumstance. One of the last times we saw Marjorie we were delighted when she pulled up with Jim Sherman to see our newly opened Shadfly Antiques shop in Port Dover. By this point she was using a walker and she moved slowly and carefully, and of course this was after the auction and she was living in a retirement home so she was not considering any purchases, but she seemed to really enjoy herself and wrote a nice little note in our visitor’s book. Short and sweet. “A great little shop”, and her signature. She looked up at me with a twinkle in her eye and said, I would have written something longer, and better but you gave me a lousy pen.” Ah Marjorie, you were an original and we miss you. 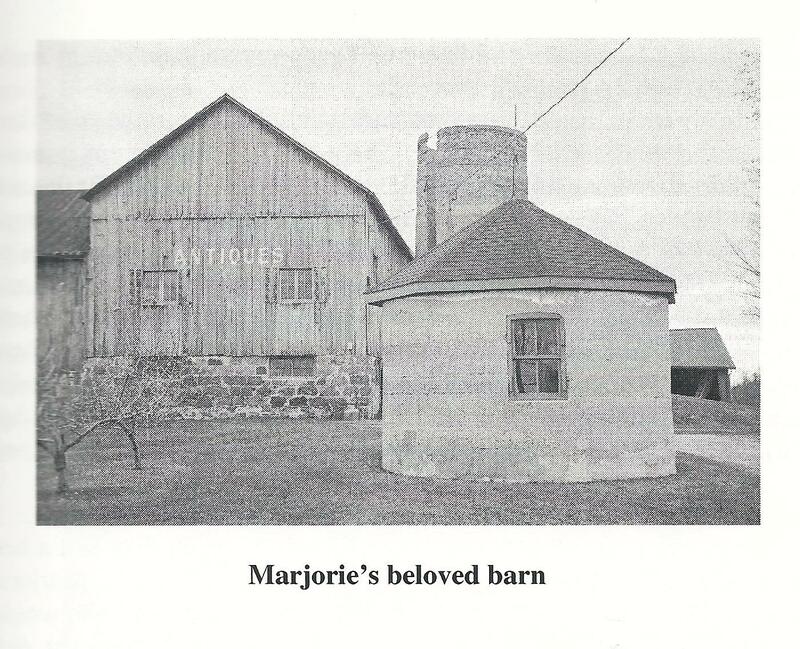 A couple of years after moving to the church, about 1984, Jeanine noticed a small ad in the local paper advertising an auction of cottages in Port Dover. The Arbour cottages had provided many families a cheap and fun summer home at the beach since their construction in the mid 1940’s, but they were small, and basic, and had fallen out of favor after forty years of service so it was decided by the owners to get rid of them and build a super miniature golf course in their place. Well, it just so happened that we needed out buildings. 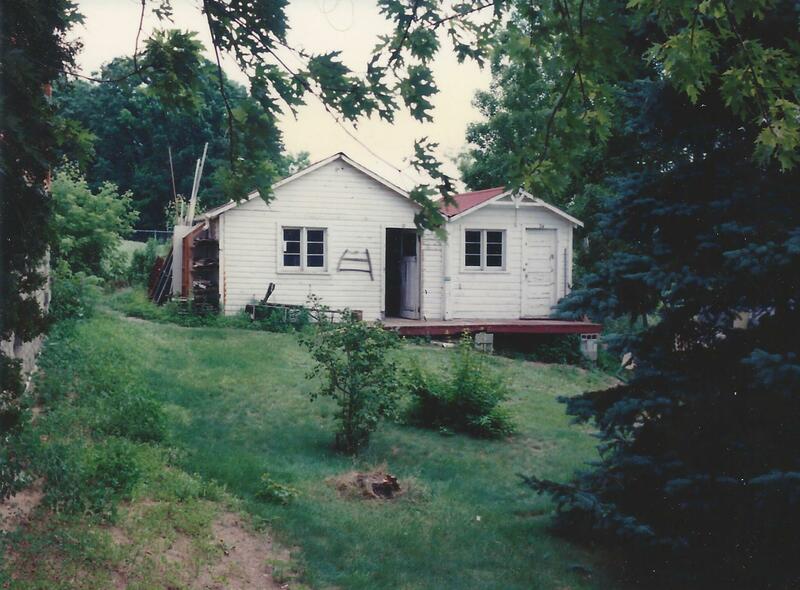 When we bought the place there was a very rudimentary workshop, and a sad little chicken coop not worth saving, and so we were planning to spend a bit to build a good workshop, with storage, and a building for the lawn mower, etc. So this seemed like a possibility to buy premade if the prices didn’t go too high. The auction was set for 10 a.m. Saturday morning and I had to be at another country auction to buy stock, so Jeanine went to see if she might buy one, or with any luck two. We knew that they were well made, and several were smaller, about 10’x10’ so in theory they should be easy to move. Small enough to go under hydro lines. There was about twenty of them in all spread along two rows. Jeanine got there about 9:30 and after having a good look decided which one’s she would try for. 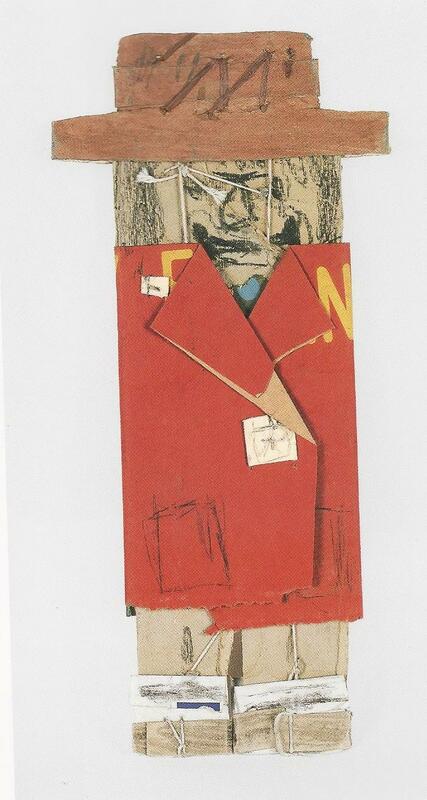 The bidding started precisely at 10, and the auctioneer must have had somewhere else to go because basically he just walked down the row, saying “O.K. you’ve had a chance to see them and remember they come with all the contents, but by that by buying one you are agreeing to have it removed completely from the premises within 30 days. Let’s begin. Do I have $300. Do I see $300. Anyone in at $250. Do I see $200. Come on folks get me started here. Let’s go.” Jeanine put up her hand. I’ll bid $50. “SOLD. O.k. folks that’s the way it’s done, so now cabin #2. Do I here $300.” Jeanine again. I’ll give you $50. “SOLD. O.K. we move on to #3. “. And so it went on for another 20 minutes or so, and when the dust had cleared at Cabin #20 Jeanine had bought a total of 6 cabins from $50 to $150 each, complete with contents, and with this one little problem in that they all had to be moved within thirty days. We were very do-it-yourself oriented in those days so after examining the situation we settled on a plan of borrowing our apple farmer friend Sergio’s large, low lying, flat-bed trailer. We would jack the cabins up onto a tower of blocks high enough to drive the trailer very carefully underneath, between the concrete pylons. Then it was simply the case of dropping the building onto the trailer and driving it the 40 kilometer distance to our place. Our farmer friend and neighbor Dave offered to help and he had a big 8-cylinder heavy duty pick-up truck he thought we could use to drive them over. What could go wrong? I’m here to tell you that jacking up a building one side at a time and slipping in concrete blocks before going to the other side and repeating the process, is a pretty hairy business. It seemed that it was always teetering on the brink and just about ready to drop, so you were super prepared to jump out of the way to save life and limb. But somehow we were able to accomplish it with a lot of encouragement from Dave, who was rough and tumble and did this sort of thing all the time. So we arrived at the moment when Dave, being our expert driver, very slowly lined up the trailer in front of the first cottage, and with his window open, cigarette dangling from his lips, looking back and forth between his two mirrors, managed to back it right up to the back of the cottage without touching the pillars on either side. This was a masterful performance considering he had less than 3 inches grace on either side to play with. Well done Dave. Dropping it on the trailer was no problem, and after securing it we were ready to take our first cabin out of the park and over to the church. No permits of course, but if they stopped us we were prepared to see just how far we could get with the argument that we had farm plates. Dave said you can do practically anything if you have farm plates. We did have a car in front with the blinkers flashing after all, and someone behind as well. It went pretty well at first. The truck seemed to be struggling a bit to get it moving, but we managed to pull out onto to the road and make a quick right, which was when we discovered that the Port Dover hill is a lot steeper than it looks. The truck was in it’s lowest gear and it only took a couple of seconds to realize it just didn’t have the power to get this baby up the hill. Yikes. Nothing to do but retreat. One of us had stopped the traffic behind, so Dave was able to back into the Cabin park again and pull it a bit out of the way. Hmm. We needed a bigger gun. So it was decided to call a friend of Dave’s who had a tow truck. Within an hour he was there and hooked up, and with the extra power we had no problem getting up the hill and down the back roads to our place in Wyecombe. He charged us $75 for the trip. We had a system. Now all we had to do is get the thing off the trailer and go for number two. As it turns out that was the tough part. Not the lifting it up so the trailer could come out so much as the bringing it back down without tipping it part. I think we managed to drop every one of them at least a little bit, but they landed roughly were we wanted them to with no damage and no one’s foot underneath. We managed the 10’x10’ cabins well but there was a larger one about 16’ x 16’ that was too large for the trailer. I went about trying to line up a couple of longer I beams to move it on, but nobody had any available so we had to resort to plan “B”. Plan “B” was to simply take a chain saw and cut right down the corners of the building allowing us to lay down the individual sides on the trailer. We just tore off the roof and trashed it. Worked like a charm. We reconstructed the building by reinforcing the corners and built a new roof and it was as good as new. Within the thirty days we managed to move the two buildings which went together to form our workshop and storage, a play cabin for our daughter Cassandra, a garden tool cabin, and we gave one to Dave for his helping us. Realizing we didn’t need any more we sold the remaining one to a gent who had turned up too late for the auction and dearly wanted one. 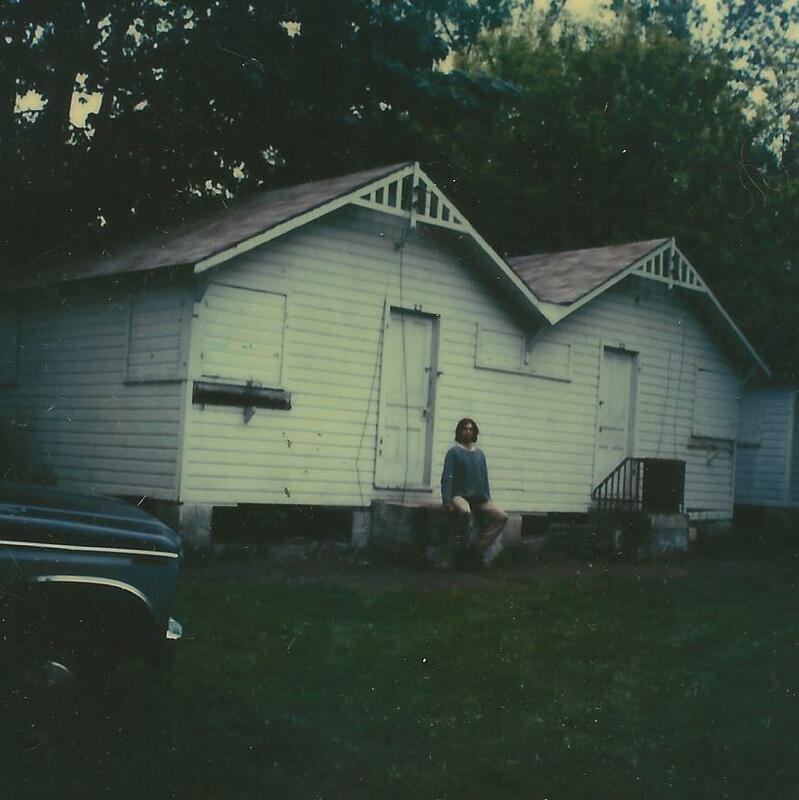 We had a lot of refrigerators, stoves and funky furniture which disappeared pretty quickly as the local tobacco farmers were always looking to cheaply equip their summer help cabins. 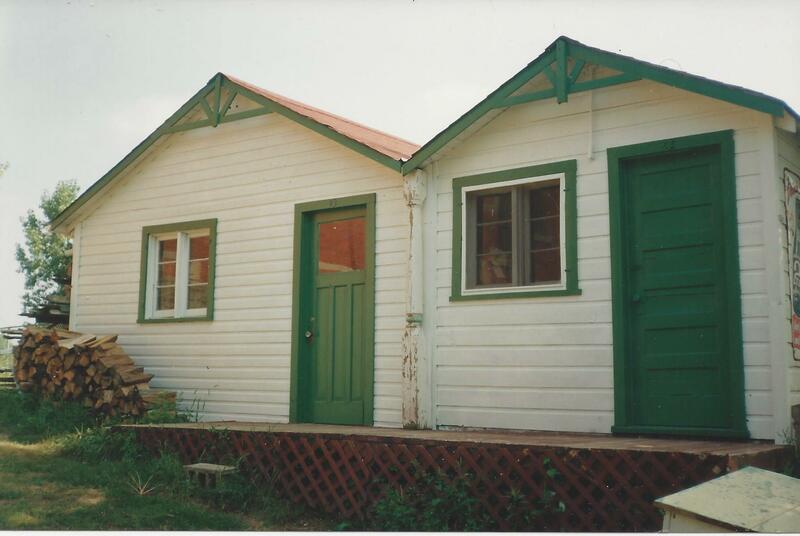 We managed to recoup the cost of purchase from selling the contents, and in the end had four great outbuildings for less than $500. Plus, we ended up with all our toes and fingers. Bonus. 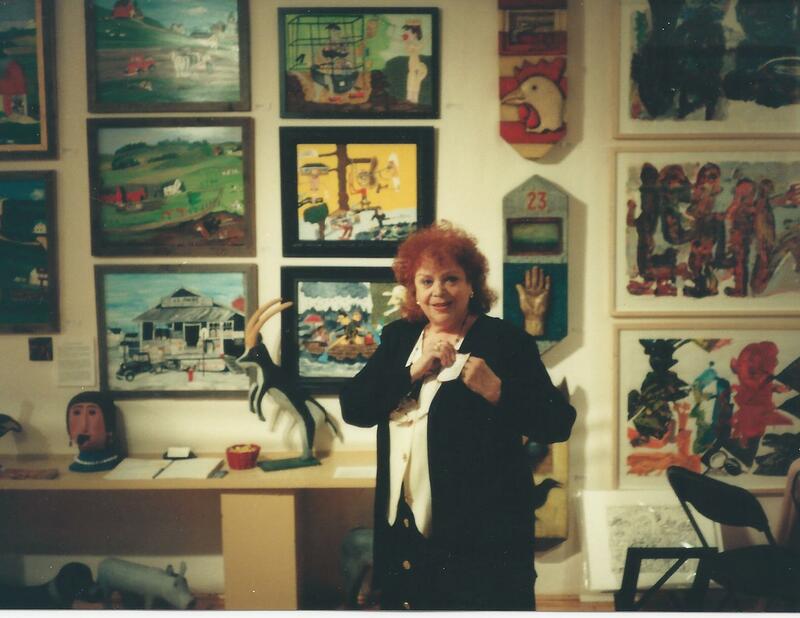 We met Canadian born, Miami based art dealer Joy Moos in 1994 at the one-time Canadian Contemporary Folk Art Festival, where we sold her some pieces, and both discovered and bought for the first time the paintings of Woodstock, Ontario artist Barbara Clark-Fleming. Joy is a character and we hit it off immediately. Then in the fall of 1995 Joy came to see us at the Church and picked out several other pieces she was interested in purchasing. 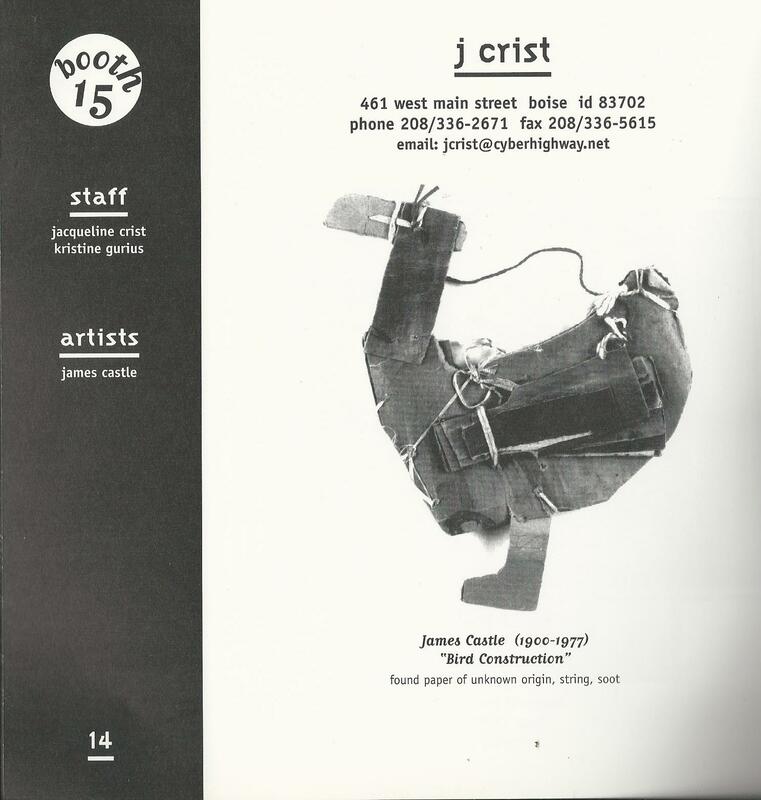 That was when she proposed that if she were to purchase a half dozen or so pieces, would I be willing to bring them to the Outsider Art Fair in New York city the following January. 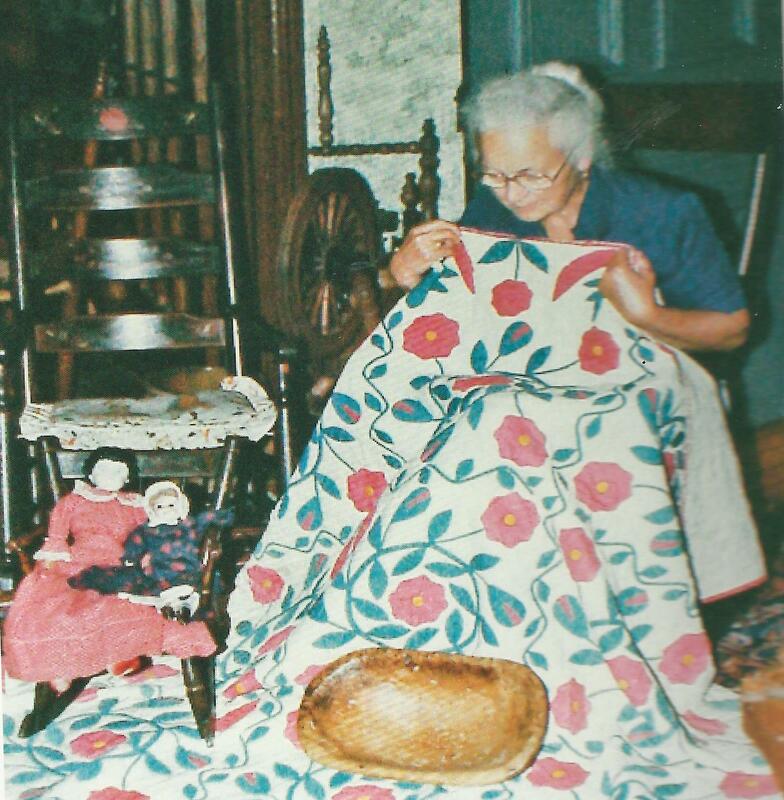 She asked me to help man her booth, and be her on- site “expert” on Canadian Folk Art. She offered to cover my costs and would allow me to bring a few pieces to sell at the show of my own. 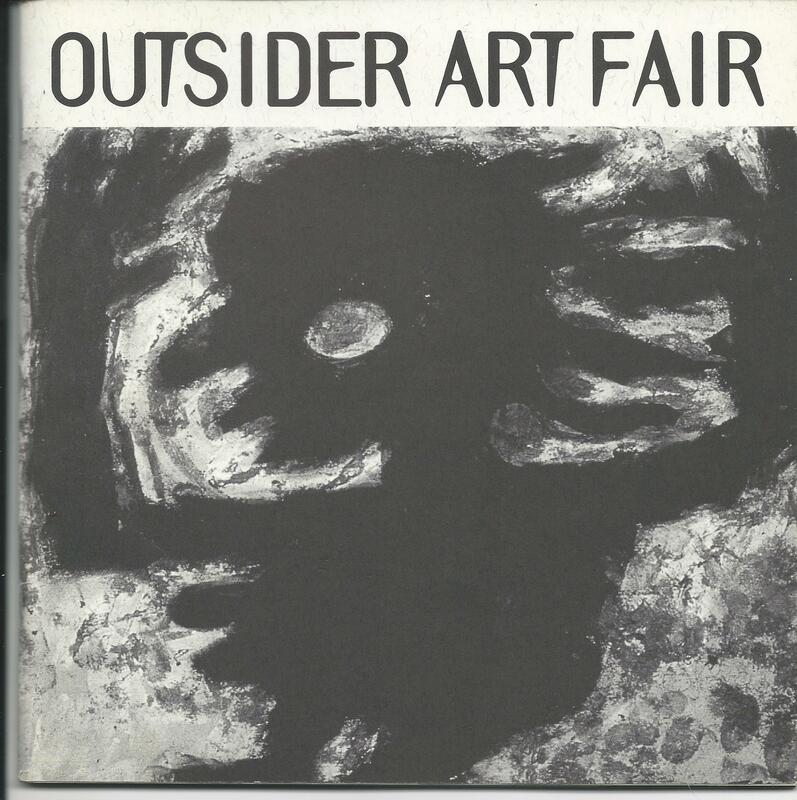 Hmmm, a chance to go to New York and see the Outsider Art Fair from the inside, and hopefully make a few bucks. “I’m in”. So early on January 24th under sunny skies I drove to New York with a van full of Canadian folk art and arrived about 3 in the afternoon at the famous Puck building at the corner of Lafayette and Houston Streets in the Soho District. She had a couple of assistance come in from Miami and it didn’t take us long to set up the booth. I then checked in to our favorite downtown hotel, The Leo House, ($75 a night at the time and clean), and then met up for dinner and an evening’s debauchery with an old pal, the Oklahoma born artist Don Bonham who lived and worked at the time in a studio in Brooklyn, situated right under the Brooklyn bridge. In spite of the late night, I arrived early Friday morning, well in advance of the 5:30 preview because I wanted the chance to look at everything before it was time to work. My show badge allowed me easy entrance, and I was immediately delighted to soak up the excitement of the pre-show set up. Lots of New York and New jersey accents coming from the workers as they scurried around setting up the lighting, carpets, curtains, etc. and a chance to see all the famous gallery owners that I’d read about for years, never thinking that I would ever have a chance to meet them, let alone participate in a show together. 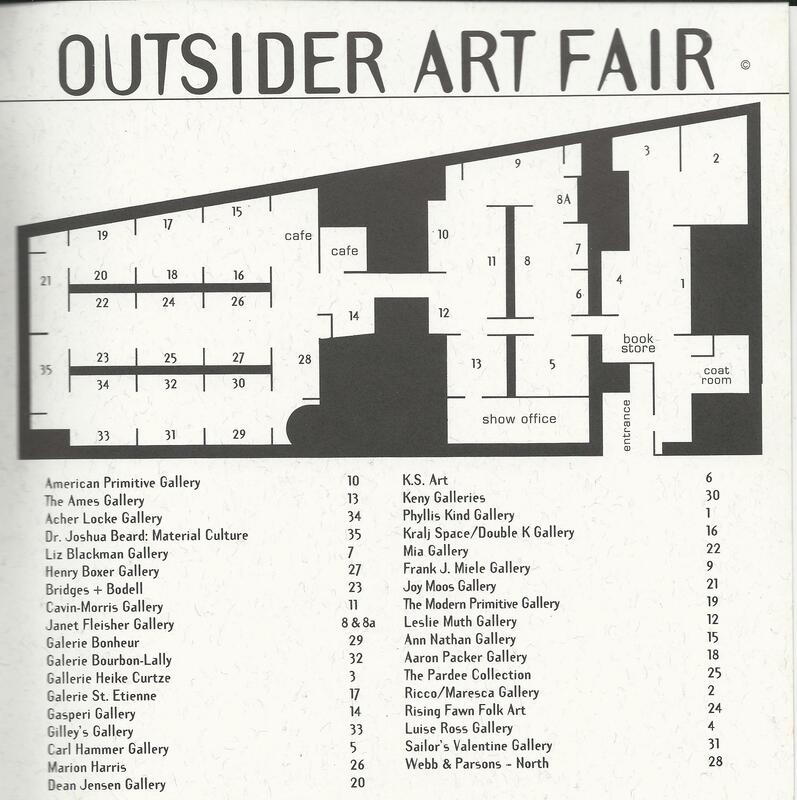 Three large rooms of side by side exhibits encompassing 35 dealers. Right across from us Dean Jensen had an expansive display of 1920’s-30’s tattoo flash that both shocked and delighted. 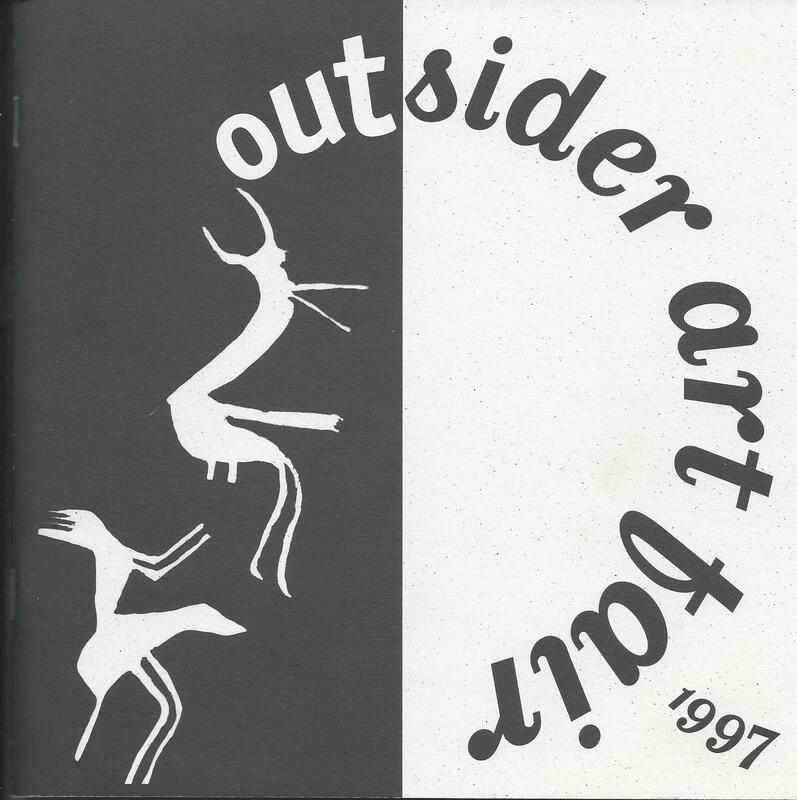 Across from them was the wonderful booth of Aarne Anton of the American Primitive Gallery. A man who was immediately welcoming and friendly, as well as informative. I moved slowly up and down the rows taking in everything. Each booth was chock a block with fabulous work. Sometimes inspiring and beautiful beyond belief, at other times dark and disturbing. It was overwhelming. 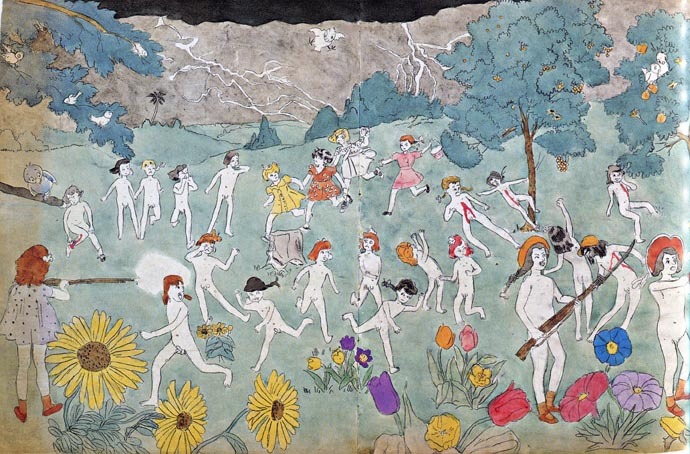 Then I moved into the next room where I could see Carl Hammer from Chicago installing paintings by the yet relatively unknown recluse Henry Darger, whose work I found both beautiful in the way a fine Japanese watercolour is beautiful, and simultaneously disturbing in that the content is what seems to be children at war, with impaling, and death, and all that war entails. My emotions were beginning to run high. I was a couple hours in and already needing a little break. 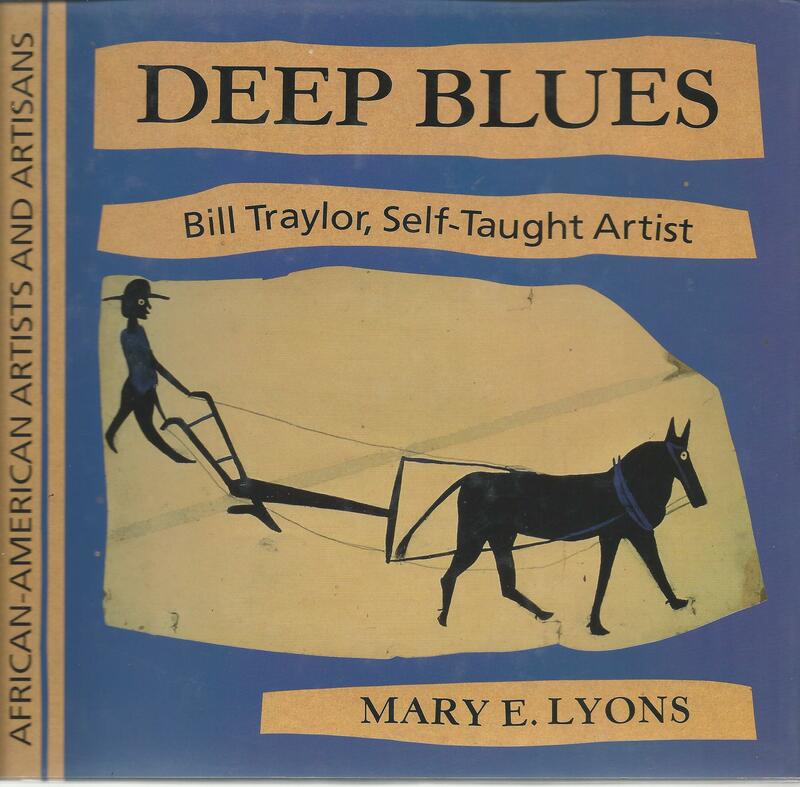 So after a nice lunch in the on- site canteen, I took a bit of time to look through the expansive book store, and noticed among other things a book about Bill Traylor, who had been born a slave on an Alabama farm in 1856. He remained on the farm until the 1930’s, when at the age of 80 he settled in Montgomery. Impoverished and homeless he spent his days sitting on a box on a downtown street drawing scenes of the life which surrounded him, and from his memories. 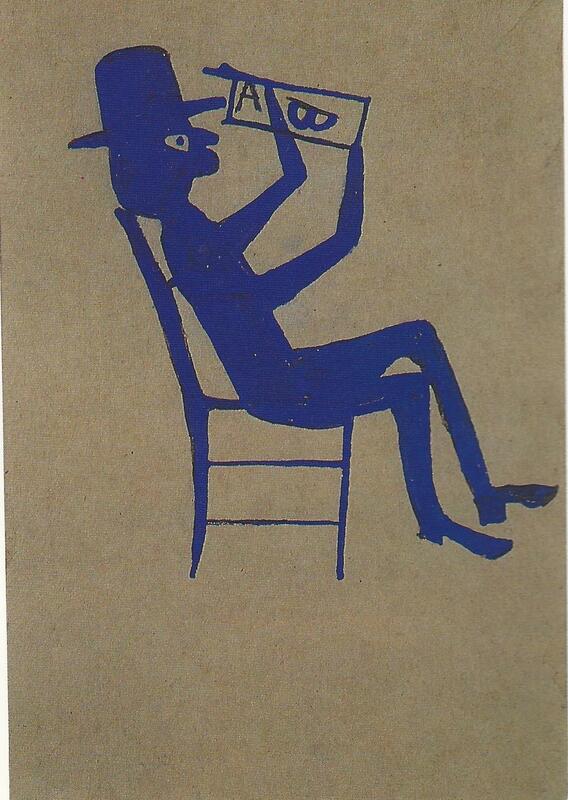 I was deeply affected by the simplicity and directness of his exquisite drawings. 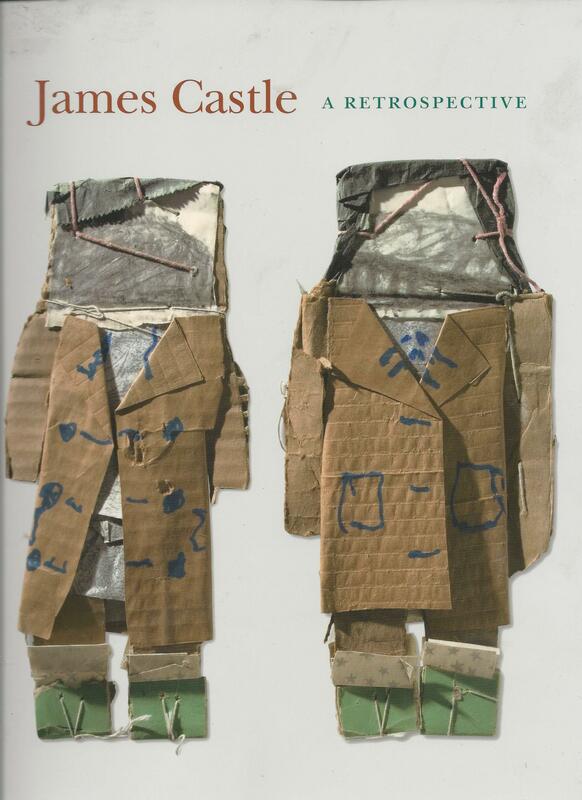 I put down my $16 and bought the book. So I only kicked myself for an hour or so before realizing that at least my instincts are good, and it was time to get on with the show. I found it fascinating to watch the wheeling and dealing going down American style. These boys and girls meant business and were frankly ruthless in comparison to my much more conservative and polite Canadian compatriots. Some of them were very open and welcoming to me like top New York dealer Phyllis Kind who closed her shop and retired in 2009 after 40 years of dedication to the cause of Outsider art. She showed interest in the photographs I brought of Billie Orr’s work and suggested I come by her gallery on Saturday when she would be in attendance. I enthusiastically complied and spent a wonderful hour talking to her. Billie, as stated in a previous blog was not interested so nothing came of it, but I cherish the memory of the meeting. Some dealers were highly competitive and not nice at all. Ricco, of Ricco/Maresca Gallery was totally dismissive suggesting he didn’t think there was any art in Canada worth bringing to the American market. All in all, I learned a lot by being the fly on the wall. Observing the “big guns” getting together and discussing who they “mutually agreed” would be the artists most favored and promoted that year. The preview was packed right up until 8:30 closing and when not selling, I was conscious of how glamourous a New York art opening really is. The stars were out. Oh look, there’s Bette Midler (very nice and much shorter than you would think). And there’s Marisa Tomei. And look it’s Mathew Broderick and Sarah Jessica Parker. Etc. The number of sales was amazing. Over the three days, Joy sold out at least half of her booth. I sold everything I brought. When I packed up and headed out for the 8 hour drive back home at 6 p.m. on Sunday, I was a happy man. I had witnessed a great amount of inspiring art, enjoyed experiencing a major American Art Event from the inside, and I had a few bucks in my pocket to take home. Joy was happy with the amount of art I sold for her, and I decided then and there to take her up on her offer to come back in January of 1997. Blog to follow. YOUR TRUCK IS ON FIRE!!! It had been a successful Odessa show. On Saturday at opening we had just arrived due to a flat en route , and were bringing things off the truck as people came in. Turns out people get excited by getting first crack at things, and several pieces were selling as they hit the ground. The mood was jovial and spirited. Dan Ackroyd and his wife came by and they were attracted to a two piece painted cupboard that they could see glimpses of on the still tied down load. She told him to stay there until it was unloaded while she went on down the line, and he was good enough to suggest helping me unload rather than just standing there watching me. Nice guy. It turned out not to be the cupboard for them, but regular Toronto customers bought it right after, so this combined with other sales indicated a strong start. It’s a great feeling to sell enough in the first hour that you have “made your table” as the expression goes, and you can relax a little knowing that even if nothing else sells you have had a good show. It didn’t happen that often even then in the heyday of the nineties. The day continued to go well in spite of the sweltering August heat, and we even had a few sales on Sunday. So, when five o’clock closing came, we were happy not to have a lot to load back on, although the Toronto couple needed the cupboard delivered to their home, and I bought a few things in the rough to take home. By about seven we were loaded and on the 401 heading west. We checked the radio for traffic and found out that things were moving slowly all the way to Toronto due to an accident and so decided to pull off at Belleville for dinner at a place we like down by the marine. We felt a bit celebratory, and content to relax, sip wine, and eat seafood while looking out over the boats in the harbor, so by the time we finished our espresso it was probably pushing ten before we were back on the road to complete the five hour (in total) drive. Feeling good and awake thanks to the espresso. Of course we were younger then and able to stay up past ten. So everything was going swimmingly. Traffic was clipping along, the CBC was playing an interesting documentary, the windows were down and the breeze was cool. We hit Toronto about midnight and I was enjoying the fact that all four express lanes seemed almost empty. Occasionally a big transport would go whooshing past me in spite us traveling at 120 Km per hour. I was “in the zone” and enjoying the oddly luminescent mercury vapor lighting and passing cityscape when suddenly there is a pick-up right behind me flashing his lights, and hitting his horn. “Alright already. Go by me there’s another three lanes.” What is with this guy? Next thing he has pulled up right beside me, and a guy leans out the window and screams “Your truck is on fire! !” Whaaat? Looking in the rear view I see flames flaring up into the night off the top of my load and realized he’s right. Yikes! It was several minutes before I could pull off safely, all the while watching the flames get higher due to the combination of plenty of oxygen , and all that dry 100 year old wood. I jumped out and surveyed the scene. Indeed, I could see that at least three things were on fire and several blankets had ignited, and of course all this was tightly secured by ropes which are also on fire by this point. The situation looked dire. First things first. Jeanine was by this point sleeping, and was not at all pleased to be woken up with the news that it was time to abandon ship and run for your life. We both ran down into the ditch thinking that at any moment the thing may blow just like in the movies. Then slowly reason supplanted panic, and we realized that the pieces on fire were up on top and we would have to stand there and watch it burn for a long time before it came anywhere near the gas tank. Let alone heat up the steel of the truck bed enough to ignite anything, so we got busy and started untying things as fast as we could, throwing the burning blankets and ropes into the ditch and stomping them out. My kingdom for a fire extinguisher. I have always carried one thereafter, and so there’s a cautionary tale for you. Other than gloves, all we had to fight the fire was a couple of large bottles of water which we saved to pour right on the burning wood parts of the furniture that had ignited. We unloaded and stomped and smothered for about fifteen minutes which seemed an eternity and before you knew it, the flames were out. The fire was mostly in the blankets as it turns out, and we quickly assessed that only three pieces of furniture were seriously damaged. Unfortunately, one of them was the sold and paid for cupboard to be delivered to Toronto. We sat in the ditch for several minutes making sure all the fire was out, as the traffic roared by quite oblivious to our drama. Nobody stopped and the half expected police never showed up. We settled our nerves, and tried to figure out how such a thing could happen. Our best guess was that a trucker had thrown out a lit cigarette and it had landed in among the blankets. A close call, but half an hour later we were reloaded and back on the road heading home, feeling grateful that things had not gotten worse. The insurance paid for some of the damage. Giving us the money we had paid for the cupboard before restoring it, and not the amount we had just sold it for. However, something is better than nothing. The hard part of course was phoning our good clients in Toronto and having to inform than that their beloved cupboard had met a deathly fate on the road home and we were tearing up their cheque. Very nice folks, they were quite understanding although they didn’t entirely believe that we hadn’t sold the cupboard for more money and then made up the story, so they accepted our invitation to come out and see for themselves. They were quite reassured when they saw it and marveled that the fire had not spread further to destroy more of the load. We felt the same. We were able to come up with another cupboard for them, and no one got hurt so I guess you can say that all’s well that ends well. Still, I would advise that get yourself a fire extinguisher, especially if you carry furniture on an open truck. The moment may arrive when you would give your left arm to have one, God forbid.